Note: "Xanadu" is a registered trademark of Project Xanadu. CosmicBook, XanaduSpace and OpenXanadu are claimed trademarks of Project Xanadu. Conventional electronic documents were designed in the 1970s by well-funded conventional thinkers at Xerox PARC, who asked, "How can we imitate paper?" The result is today's electronic document-- Microsoft Word format and the printout format PDF. They imitate paper and emphasize appearance and fonts. But much earlier, in 1960, the Xanadu project started with a completely different idea: since interactive screens are coming (who else knew? ), we asked a different question: How can we IMPROVE on paper? 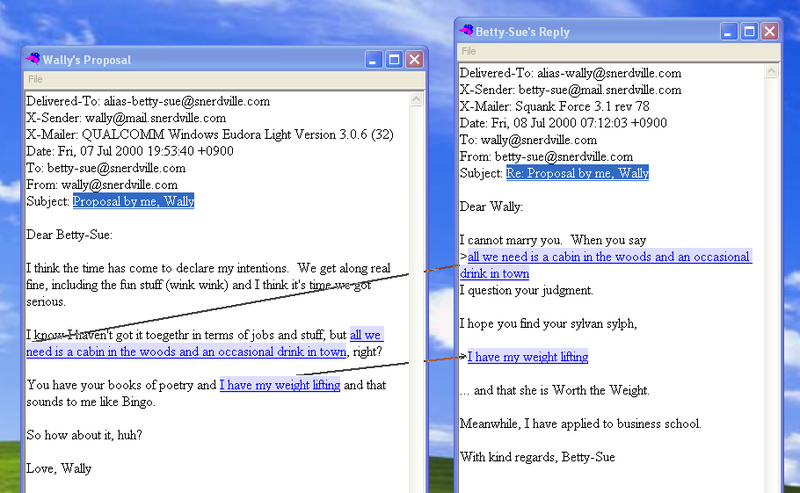 We foresaw a new screen literature of parallel, interconnected documents. * Theodor H. Nelson, “As We Will Think." Proceedings of Online 72 Conference, Bruanel University, Uxbridge, England, 1972. 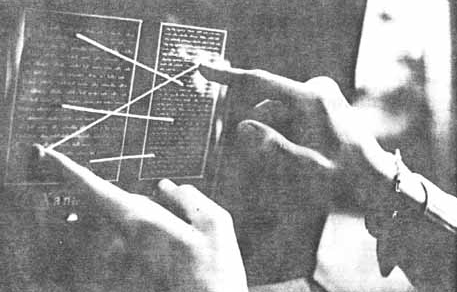 A closeup below, from that same paper, shows visible interconnection between two screen windows. Thus an author may show the exact connection between writings on different pages. The visible connection becomes a structural part of the writing, as fundamental as a paragraph or heading. 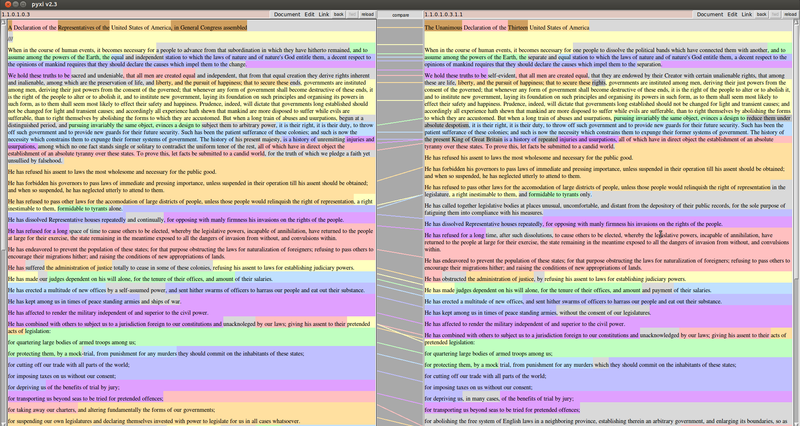 Note that this provides a generalized way of representing parallel documents and their precise connections-- such as the Talmud, legal commentary, or the comments on the long poem in Nabokov's "Pale Fire" by his fictitious literary critic, Charles Kinbote.. 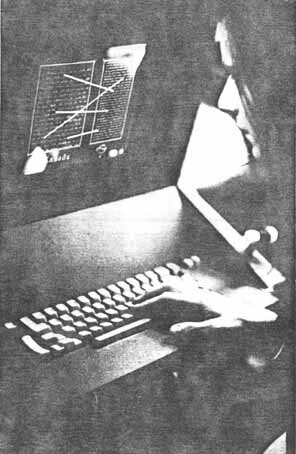 When Xerox PARC released their first computer with a "modern" interface, the Alto, they did not offer visible connections between windows, though such connections would have been possible. * But when the Alto was imitated by the Apple Macintosh and then Microsoft Windows, such connections became impossible. And needless to say, the further imitations of these windows on Linux don't make such connections possible either. * Alan Kay, personal communication. The standardization he allowed in his document format only allowed jump-links, with no visible bridges between them. We have continued to pursue these ideas, with no funding and no support, and despite ridicule and attack. Here follow screen shots of some of our functioning prototypes. Two Versions of the Declaration of Independence, by Ka-Ping Yee (1999). Yee's graphical interface, Pyxi, connects directly to the Xanadu Green server. Work on Xanadu Green, a server designed for parallel documents, has been continuing under Roger Gregory. CosmicBook™, Nelson with Ian Heath (2003)-- Windows only. Heath's method bypasses Microsoft's windowing system, creating an overlay for the entire screen on which he draws the connection-lines. XanaduSpace™, Nelson with Robert Adamson Smith (2007)-- Windows only, unchangeable contents. Smith's system represents all pages as slabs within a 3D space, moving between 3D positions on user command. Highlighted sections of text are separate 3D objects ("tetroids", named after a shape in the game of Tetris) connected by beams. Pages, tetroids and beams are all objects sworfing (swooping and/or morphing) together. The system was intended in principle to fetch contents from the net, but did not reach that stage. 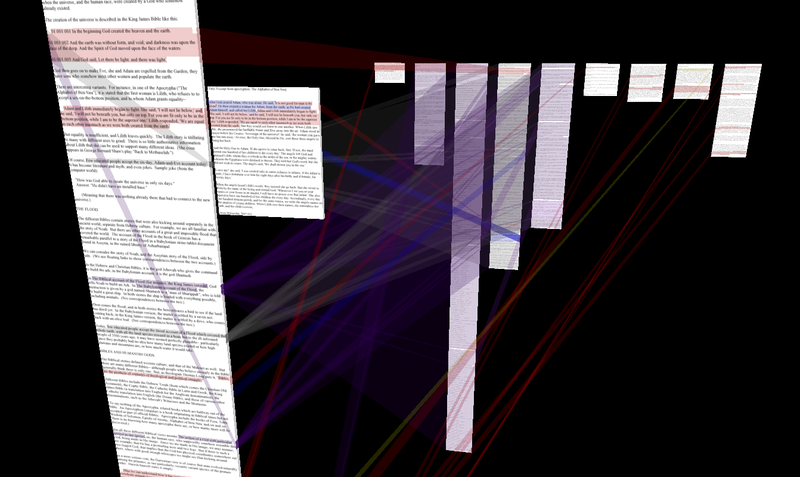 OpenXanadu™, Nelson with Nicholas Levin, 2014 (various mechanisms inside the web browser). 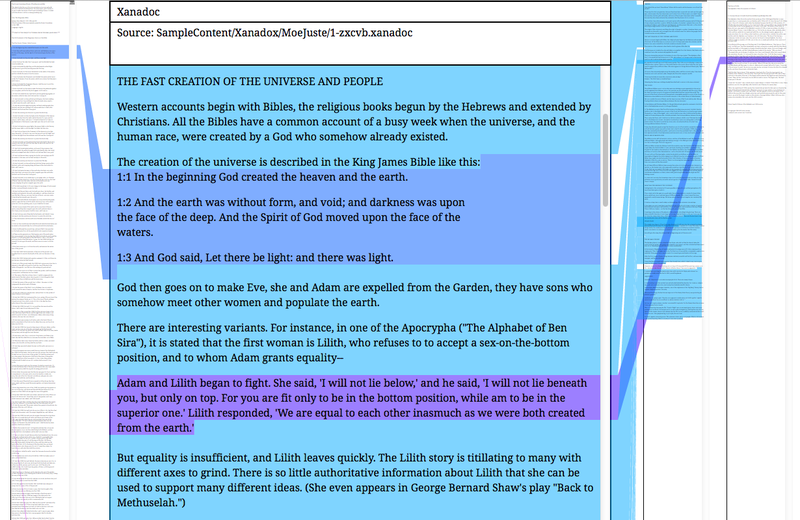 Using cascading style sheets and other browser methods, Levin scrolls the various text sources (note that the entire Old Testament is in the column on the left) and their connecting bridges to the central article. Only the origins of quotations (transclusions) are shown; xanalinks could be added, but we do not consider this approach worth pursuing. This prototype actually does fetch contents from the net, should users want to show their own data. However, we have no time to document it. With our limited resources we can only go slowly, unlike today's Red Bull-fueled young teams. Though our ideas have been pushed out of the way, they are still good. We expect vindication, and eventual acceptance as a fundamental document type and format that will stand tall against the paper imitations. No one else is pursuing this approach; everyone is hypnotized by the Web browser, which is basically crippled for these purposes. What we need is not just visible connection, but a rational and extensible structure behind it-- a way of grouping parallel documents and managing their visible interconnections. That is defined bythe data structure, which we will publish when ready.